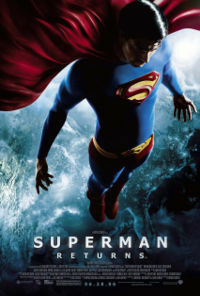 Superman Returns is a 2006 superhero film based on the DC Comics character Superman. Directed by Bryan Singer, the film stars Brandon Routh as Superman, as well as Kate Bosworth, Kevin Spacey, James Marsden and Parker Posey. Superman Returns is a loose continuation of Superman (1978) and Superman II (1980). The film tells the story of Superman returning to Earth after several years of absence. He finds that Lois Lane has moved on with her life and that Lex Luthor is plotting a scheme that will destroy the United States. After a series of unsuccessful projects to resurrect Superman on the screen, Warner Bros. hired Bryan Singer to direct and develop Superman Returns in July 2004. The majority of principal photography took place at Fox Studios Australia, Sydney, while the visual effects sequences were created by Sony Pictures Imageworks; filming ended in November 2005. Superman Returns was released with positive reviews, and grossed $391 million in worldwide box office totals. However, Warner Bros. was somewhat disappointed with the box office return and are now considering a future reboot of the Superman franchise.